ICRP, 2015. Radiation Dose to Patients fromRadiopharmaceuticals: A Compendium of Current Information Related to Frequently Used Substances. ICRP Publication 128. Ann. ICRP 44(2S). 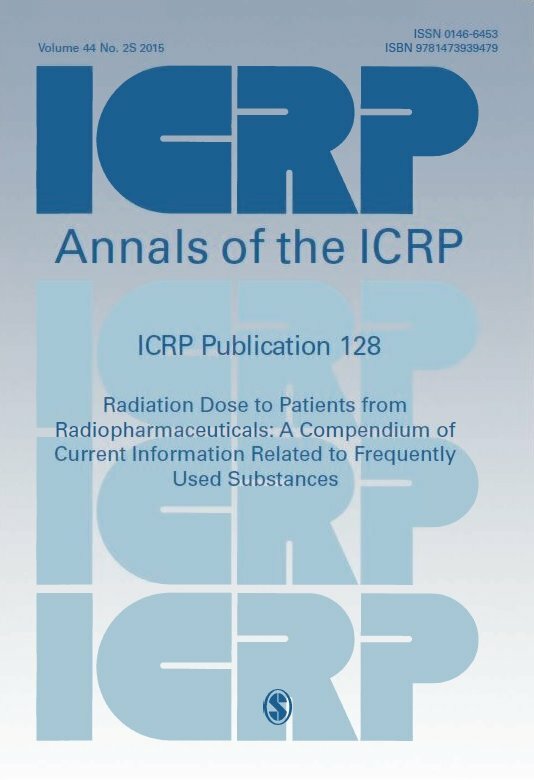 Abstract - This report provides a compendium of current information relating to radiation dose to patients, including biokinetic models, biokinetic data, dose coefficients for organ and tissue absorbed doses, and effective dose for major radiopharmaceuticals based on the radiation protection guidance given in Publication 60 (ICRP, 1991). These data were mainly compiled from Publications 53 , 80, and 106 (ICRP, 1987, 1998, 2008), and related amendments and corrections. This report also includes new information for 82 Rb-chloride, iodide (123 I, 124 I, 125 I, and 131 I) and 123 Ilabelled 2.-carbomethoxy 3.-(4-iodophenyl)-N-(3-fluoropropyl) nortropane (FPCIT). The coefficients tabulated in this publication will be superseded in due course by values calculated using new International Commission on Radiation Units and Measurements/International Commission on Radiological Protection adult and paediatric reference phantoms and Publication 103 methodology (ICRP, 2007). The data presented in this report are intended for diagnostic nuclear medicine and not for therapeutic applications.